The Ultra Street Avenger carburetors feature all aluminum construction and are equipped with metering blocks and a base plate made from 6061-T6 billet aluminum. They weigh in at approximately 5 lbs less than a comparable zinc carburetor. 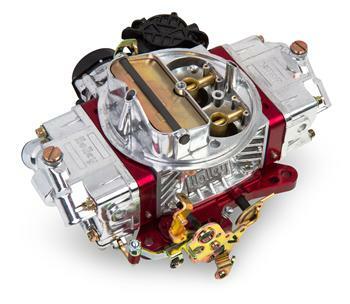 The new Ultra Street Avenger carburetors have the same great features as their aluminum counterparts such as a tumble polished aluminum finish; quick change vacuum secondaries for easy tuning to optimize performance or fuel economy; four vacuum ports for all necessary vacuum accessories; factory preset electric choke for easy startups; built-in fuel filters; and an included fuel line kit so there are no unnecessary trips back to the parts store. Ultra Street Avengers feature the same optimized street calibration as the zinc versions so you know they will run great on your vehicle. In addition, the Ultra Street Avenger now comes with anodized metering blocks and a base plate made from 6061-T6 billet aluminum and a built in, clear fuel level sight glass for easy, no mess fuel level adjustments.